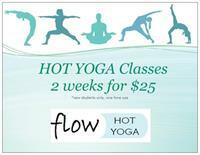 Flow Hot Yoga is the premier HOT YOGA studio in Vancouver & Camas that offers 60 minute hot yoga classes. 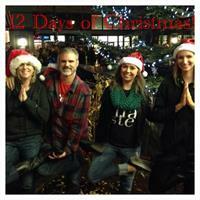 We provide a warm environment, hands on instruction, and a beautiful yoga community. Give us a try we are different than your typical Hot Yoga studio. We have the most supportive and great yoga community around, we provide hands on adjustments, catered modifications to fit your specific needs, supportive and clean space (no carpet! ), and all of our instructors are Yoga Alliance certified and are always working to continue their yoga education to provide you the best instruction around! 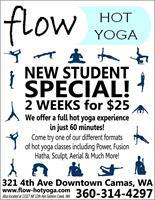 Power, Fusion, Hatha, Yin, Sculpt, Aerial, Kids yoga and much more! Located right off the freeway in Salmon Creek. Easy access to shopping, restaurants and the park and ride!